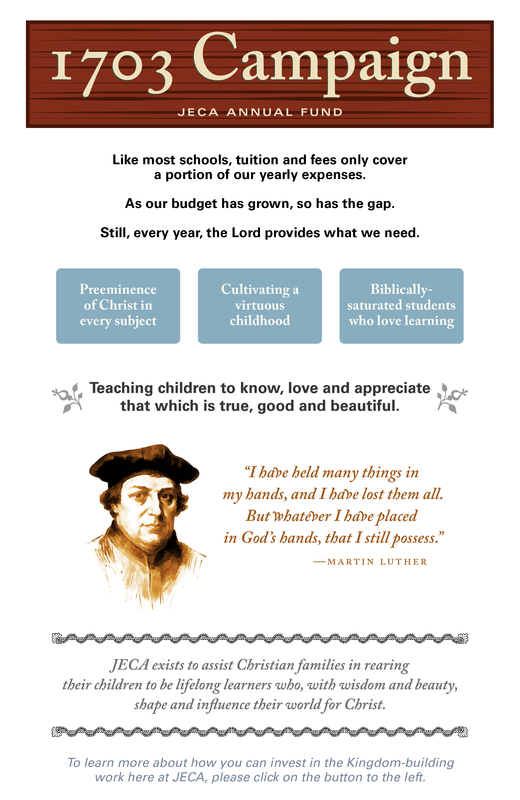 As Jonathan Edwards Classical Academy celebrates its 10th anniversary, we also celebrate 10 years of God’s grace to our community through generous giving by parents, grandparents, faculty, staff, loyal friends, and volunteers. Our ministry partners understand that a gift to JECA is an investment in the kingdom of God. We know that whatever we store up on earth will remain here when we leave, but whatever we store up in heaven will be waiting for us when we arrive (Matt 6:20). Our donors understand this beautiful reality and year after year God has faithfully provided for the needs of our school through the generosity of those surrounding us. Thank you for your support in making JECA such a unique place where the positive virtues of truth, goodness and beauty are paramount. JECA is an independent school without formal affiliation to a church or denomination. We are non-public and take no money from the government. As such, we have no governing body to provide taxes or tithes, and yet, every year God has provided what we need. Would you consider joining the good work that God is doing at JECA?